This is a completely customized Snowboard and Ski Board Wedding Cake Topper ordered by one of our customers. Two adorable figurines make up this funny skiing wedding cake topper with groom in his red snow jack, yellow ski boot and bride in her green snow jacket and brown ski boot, both holding their ski boards and ski poles. 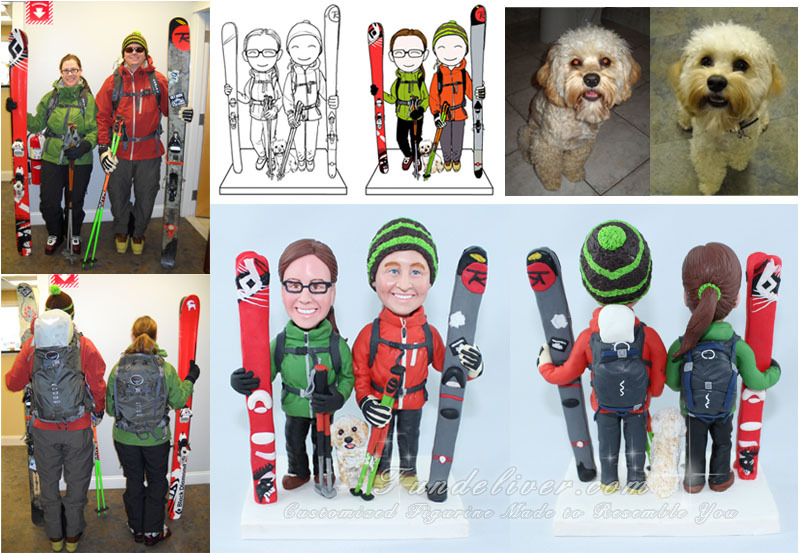 They would like to have their dog (Tuckerman) in between them peeking out from behind the ski poles which turn to be a great highlight of this Snowboard and Ski Board Cake Topper. They don’t want to add that stylish sunglasses for groom but that green and black ski hat (as left part of above image) is wanted and made. Snowboarding and skiing theme wedding is becoming more and more popular recently. 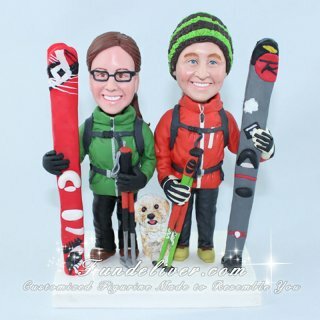 Perhaps you and your fiance/fiancee met in this skiing cake topper, check following for more Couple Skiing Wedding Cake Topper, Skiing Wedding Cake Toppers and Skier Cake Toppers. Just release your imagination, tell us your idea, we can work together to make your ski theme wedding perfect.